Why do I like Richard Dawkins? There may be many reasons but here is a footnote on The Greatest Show on Earth in which he rants against using the form “Beijing” instead of “Peking”. I’m no scientist but I do share this trait of character that makes you expect respect for the conventions and consistency across languages, rules, and systems… I’d really find very difficult to build knowledge on without it. I admit I’m quite bad at small talk. Weather is considered the universal topic to avoid awkwardness but if you meet me you are at risk to make it even more uncomfortable for you. In Ireland, where I live, weather is quite bad: rainy, often windy, and unstable. When people learn I come from Spain they either ask me whether I miss the Spanish weather or just directly assume so. Many people from the British Isles go to Spain on holiday every year, in most cases to the Mediterranean coast or the islands. Most of them completely ignore the northern half of the country, and after Madrid and Barcelona their inner Spanish geography handbook just includes important hotspots such as Ibiza, Mojácar, Benalmádena, Fuengirola and the like (with funny placename pronunciations which make it slightly difficult for me to guess). I’ve come across some folks who enjoy being and looking classy and let me know they’ve been to the real heartland of Spain, which seems to be between the centre and the North of the country. They do know indeed that the North is cooler. I’ve been watching the Spanish weather forecast since last week and it seems that for most of the time my hometown of San Sebastian has been only a couple of Celsius degrees warmer than Dublin. For example last Monday (28th July) they were enjoying 22 Cº there for the 20 Cº we saw in Dublin. 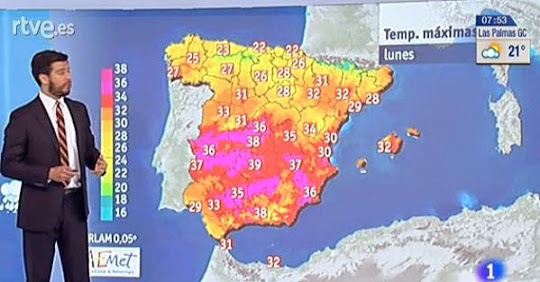 On the same date Madrid was boiling at 36ºC and some Spanish regions were around 40ºC. However my people in the northern corner near France were enjoying our oceanic climate, which is basically the same as in Britain and Ireland (with a few nuances). Regarding the 2 degree difference, it actually works like this around the year. Weather in San Sebastian is seldom more than 5 degrees hotter than in Dublin. It also rains quite a lot down there, so I’m not in the least annoyed by the rain here. In fact I only dare to call rain, like “real rain”, to what we experience in the Basque Country whereas Irish precipitation is mostly made up by thin drops of drizzle. Wind is the really annoying part of the Irish weather in Dublin. It offers an awful chill factor and is responsible for the climatological lack of stability. It also makes umbrellas almost unusable. Very rarely you get soaked by the Irish drizzle so you could walking down the streets happy and umbrellaless most of the time. The main practical difference is that you can more or less predict how the day will turn out when you are in Spain whereas in Ireland you don’t know what the sky is going to bring you in the next half hour. Splendid sunny Spanish days that nothing can waste or days in which it won’t stop raining versus the lottery of Irish weather in which most of the tickets aren’t carrying great chances precisely. Apart from that, the other element that annoys us Mediterraneans in the periphery of the continent is the lack of sunlight hours in winter. This effect of latitude conditions weather, but its effect in the human body (vitamin D) and joy for life is larger than the havoc a few wet days can cause. Anyway, there is some compensation for it in the longer summer days, especially in May-June-July where sunlight lasts until 23h. So, no, I come from Northern Spain and the weather there is quite similar. I don’t miss the weather. In April 2009 I stepped in Cologne. I arrived by train from Hanover in a night in which I hardly could see the monstrosity of its cathedral, just in front of the station. I used the following day to stroll around the most typical places of the city. I was a hot humid day which persuaded me not to follow upstairs to the spire of the cathedral. Luckily, the next day, in which I should follow my trip to a Duesseldorf, started clear and shiny, ideal for the scheduled ascent. One of the best-known German words among those who don’t speak German. We came across it in a sign to advise about the danger posed by the tramways. Certainly they are more difficult to be seen, and therefore more dangerous, when you walk looking to the ground, so the placement seems about right. A pub named after a chess defence which includes a chess knight graffiti on its wall. Nothing special, but otherwise I wouldn’t reach the magical number fourteen. 3. Fist and ear statue. My imagination does not reach the meaning of this statue. It must be the fight against deafness as much as the concept that listening to others makes us stronger. None of the ideas that came to my mind seem to be specially full of sense. Inside the ear there was litter and some cigs butts, but I’m quite sure it is not an ashtray. Best location for tourist photos. I have one myself, ice-cream crashed on my head in tower-of-pisa fashion, which I don’t include here out of sheer shame. The cathedral of Cologne is a spectacular mass. Certainly it is in the first place on the list of things worth seeing in town, but it has not place on this list. What does fit on my list of funny things is the piece in front of the cathedral of which it is said it is identical to the one on top of each of the towers, 140 metres above. One can imagine the efforts to put it up there. Awesome in every sense. There is an interesting example of stained glass inside the cathedral. It looks like a tribute to the geek world. The colours of stained glass have always fascinated me and this is no exception in spite of its low definition. In the old town, die Altstadt (actually not so old as not much of the city survived WW2) there’s an area of narrow streets and restaurants. In one of those this lamp held by a whale could be seen. In an Italian restaurant’s gents there was a football-themed latrine with its goal and all that. There’s a pink football and even if I’m saying too much I’ll let you know that you can move the ball but it is impossible to score. 9. Street ground, orchestra ceiling. The auditorium in which the Philharmonic rehearses is under the street, more specifically under a square beside the railway tracks. near the cathedral. Apparently, people stepping may disturb the acoustics, so whenever there’s a concert or rehearsal some men prevent pedestrian from stepping over the musicians. Acoustic law and order agents. The cathedral on the background. A friendly alien on a post beside the tracks. It must be one of those guerrilla art actions. This is a meme which has been spreading recently. I think I’ve heard the city of Florence is going to fine the assholes which may uglify it with this kind of junk. The happy couple places its lock with names or initial in a public place and then get rid of the key, or eat it, or keep it until their love is rust. In Cologne the chosen venue is such a city icon as the railway bridge. Futuristic architecture is everywhere but it is still interesting to watch buildings of this type and size. As I saw them from the distance I’m not sure whether the shape is designed in order to keep the room at the base or to provide with shadow and shelter from the rain. Germans love antiques in street markets. In this Flohmarkt (flea market, as it is in French or English) and other similar one can trade coins, stamps, old postcards. Also some more unusual stuff such as this elephant. I cannot imagine its price or the use it can serve. A bookshop chain example of advertising in an underground crossing stairs. The concept is that each step represents the spine of a book. A metaphor full of beauty and wonder, as every book is a new step in life. After several months 14 funny things I saw in Cologne about the city of Cologne (Köln), is one of the most successful posts in this blog, so I started working in an attempt to show some of the interesting things I could see in the Hanseatic city of Hamburg some days before. I’ll get the pictures out of its folder and will comment them more or less in chronological order. 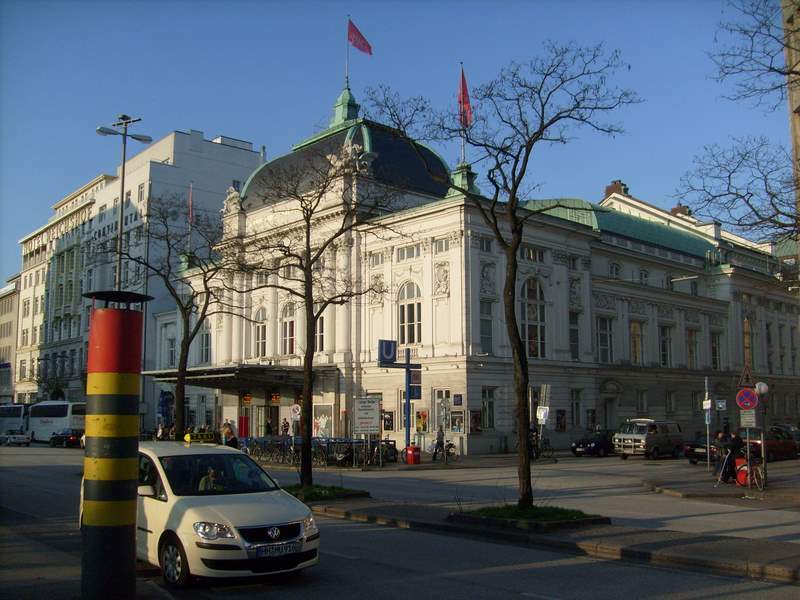 The first day in town we were strolling around the city centre where we could see the German Theatre (Deutsches Schauspielhaus), which reminded me the Opera of Prague. Funnily, once we got closer we saw a plaque in which they mentioned the architect was actually the same man. Hans Hummel. 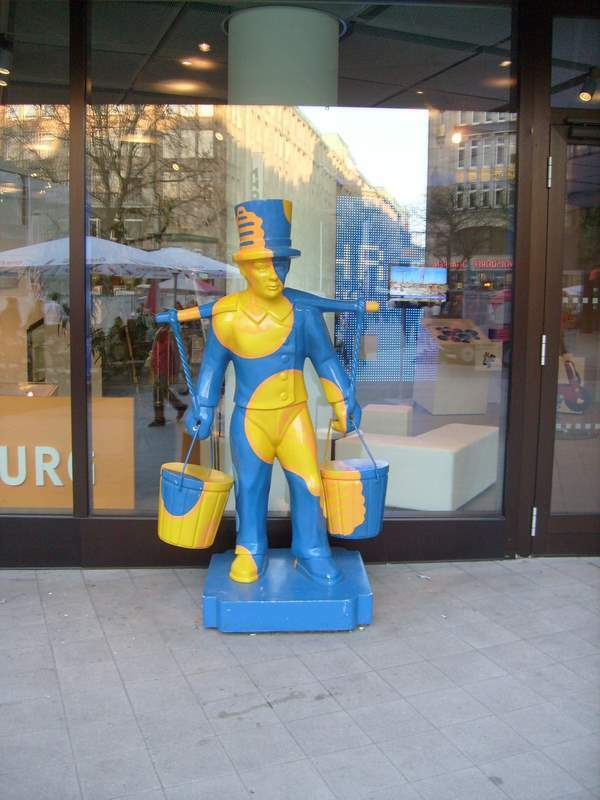 This water carrier is a typical character in Hamburg. He can be found in different places around the city, especially on postcards. Apparently he was one of Hamburg’s water carriers before the times of the running water, but he was also a poor man the children laughed at. The German Wikipedia says he lived between 1787 and 1854. 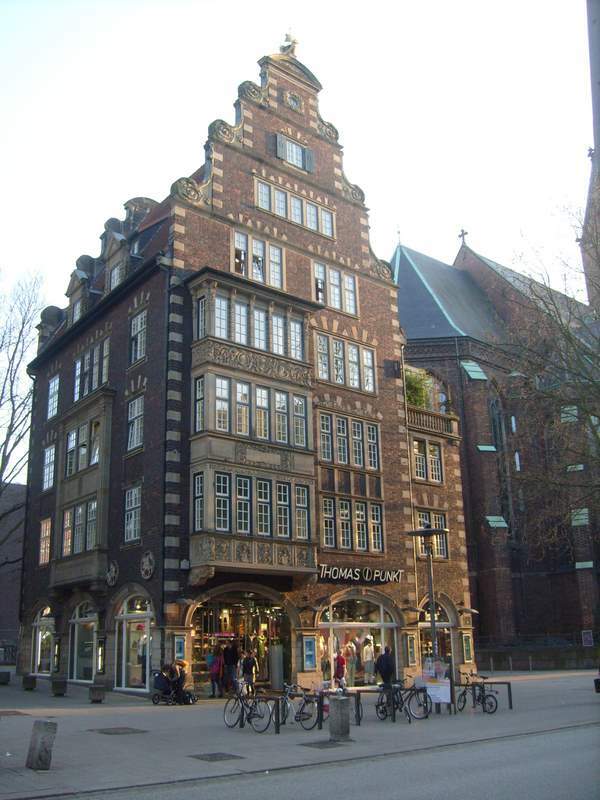 Some of the buildings in Hamburg made me remember the houses of Amsterdam. I’m not sure if the architectonic style when from city to city on the ships that sailed the northern seas. Art and commerce together. 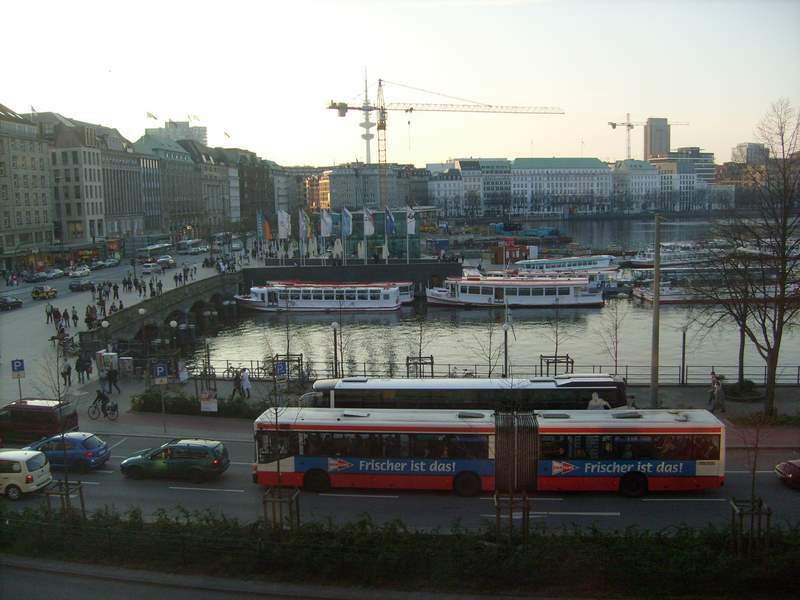 From one of the wonderful bookshops of Hamburg (an urban feature from which Spain should learn) we can see the area of Jungfernstieg, a street in front of river Alster at Binnenalster, which seems a lake but it is not one. Hamburg is placed where two rivers meet. River Alster is a tributary of the Elbe. Interestingly, the port of Hamburg on the banks of the Elbe is 88 km away from the river mouth into the Baltic Sea. 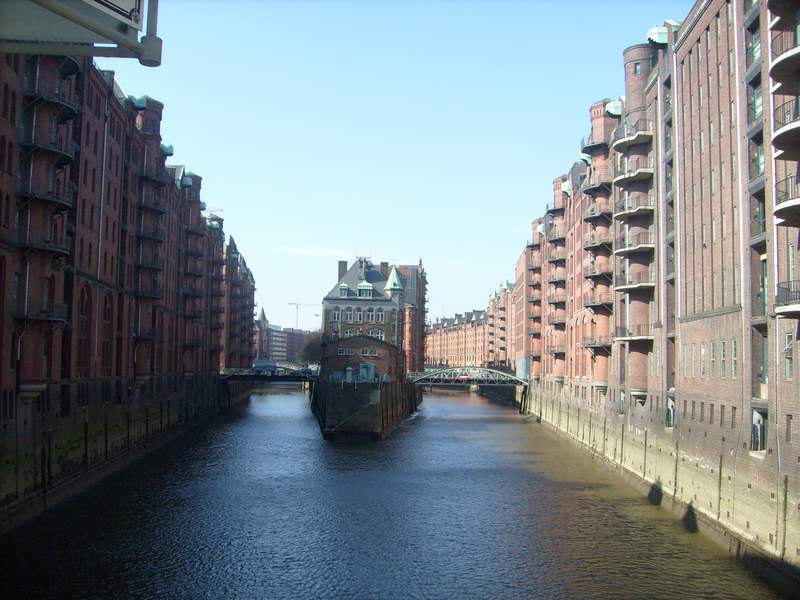 Hamburg, which boasts one of the most important ports of the world is a port city but not a seaside city. Hamburg’s City Hall is a building of peculiar beauty. It is at the very centre of the city, a few metres away from Binnenalster. Even if we arrived at dusk and could not see its interior, it is not difficult to realise that this is an impressive building. I spent some time looking at statues, as the one of victorious archangel Michael. I still ignore what the function of the post in from of the city hall is, but it includes a nice ship on its top. 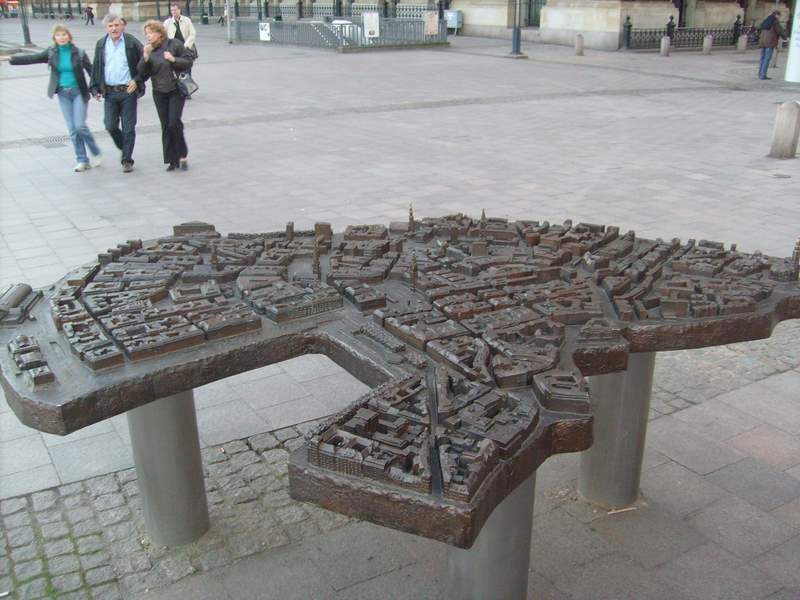 Beside the city hall there is a 3D map of the city centre. 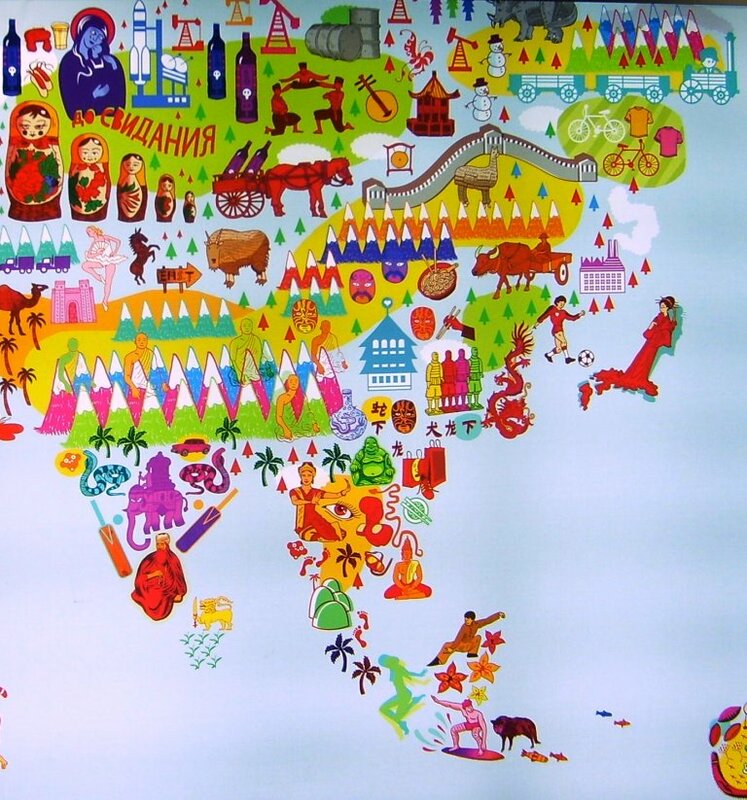 It is certainly some help for the blind and a pleasure for cartographers and map aficionados. Binnenalster and the city hall square in which the map sits can be seen perfectly. The farther side of the map represents the flow of the Elbe. 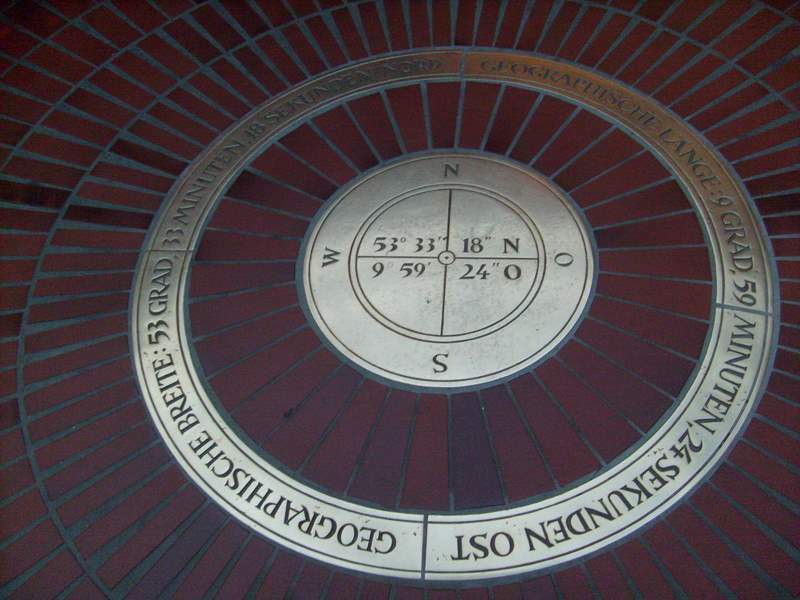 We came across the geographical coordinates of Hamburg 53°33′18″N 9°59′24″E in a shopping centre. For Spaniards, it is Important not to mix the O for Ost (East, in German) with the O for Oeste (Spanish for West, which in German is W, West, the same as in English). Meridian 10° E runs trough the city. In fact, Google Maps provides 53°33′55″N 10°00′05″E as coordinates. 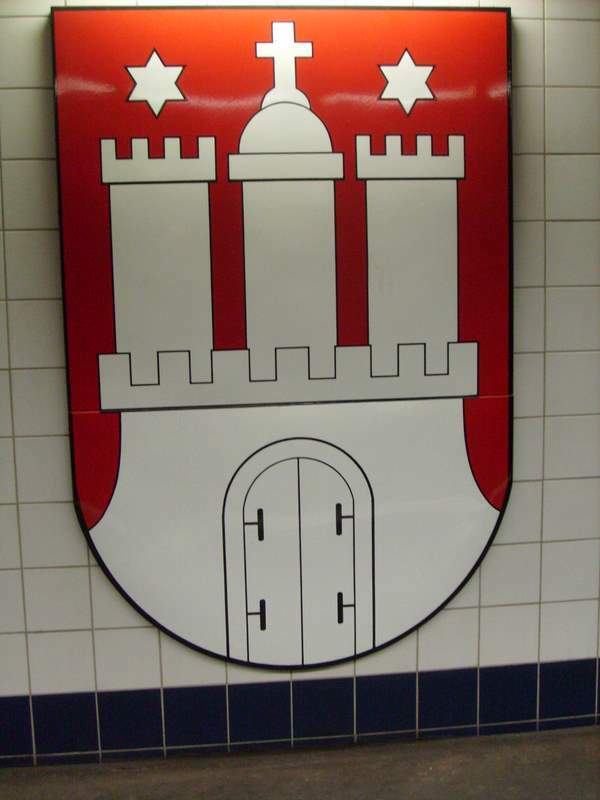 In the underground station “Rathaus” (City Hall) the tiles in the wall showed the city’s coat of arms, which I’ve seen so many times on a coffee cup at home. One thing which drew my attention was a lever to stop trains, if needed, sitting on the platform. 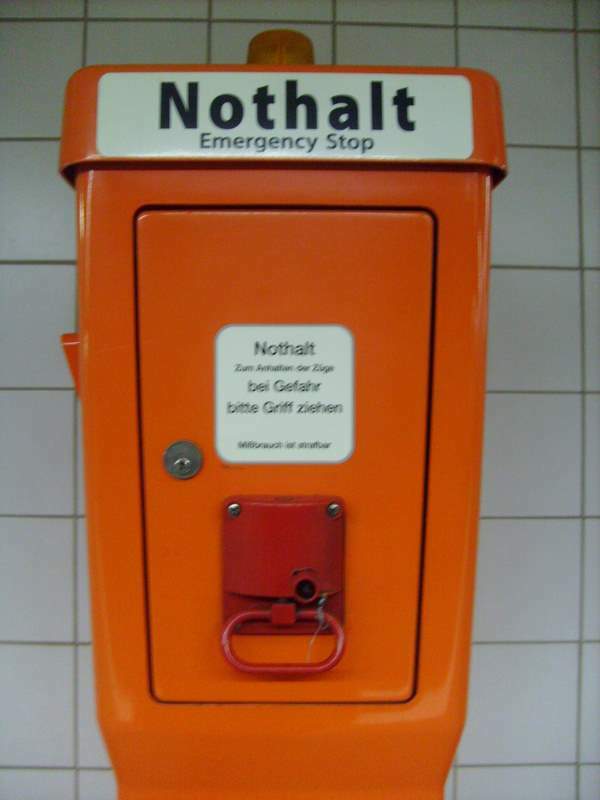 I had seen this kind of device on trains, but never outside them. The easter egg thing is not specifically from Hamburg, but a tradition in the whole Germany. 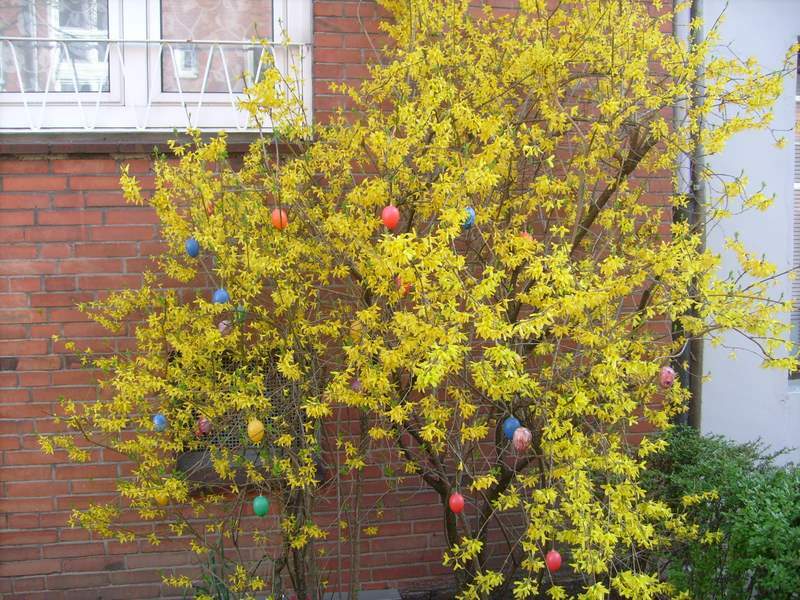 The next morning we found several shrubs decorated with plastic eggs, but the real ones are edible. Typically, children paint them in gaudy colours. Interesting architecture. 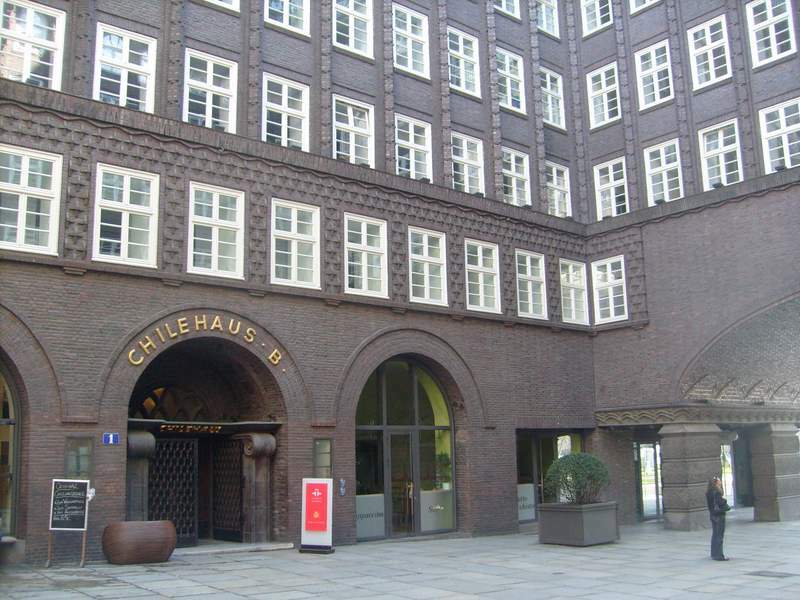 Chilehaus, with its geometrical design, is one of the outstanding buildings in Hamburg. Seen from one of its angles it shows a ship shape. It is said that the project was commissioned by a man who became wealthy in Chile. Among other things, it houses Instituto Cervantes. 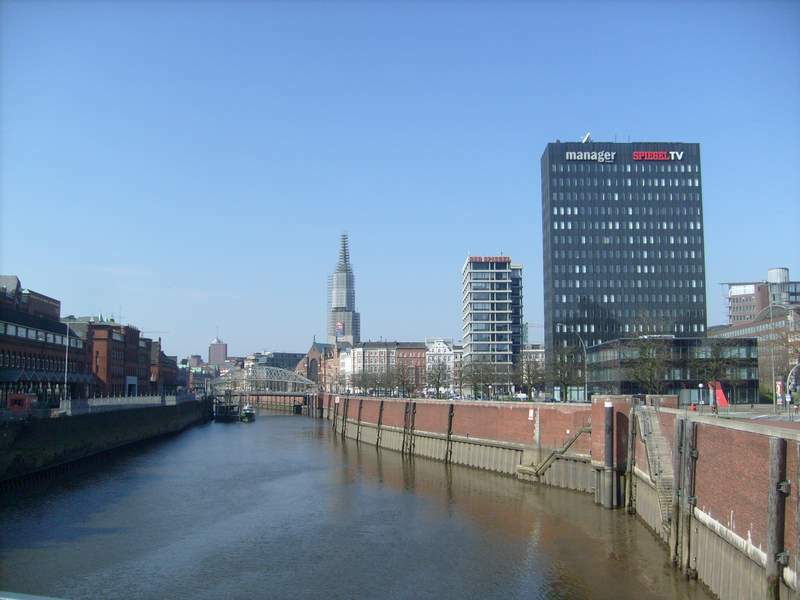 Hamburg is the capital for Germany’s newspapers, publishers and media. In your walk you’ll recognize the famous names. The storehouse area is a whole journey to the 19th century. 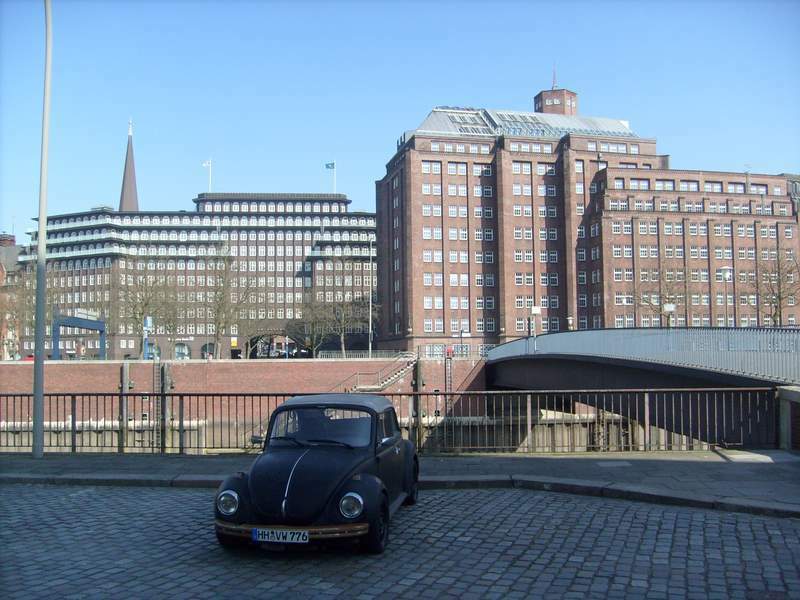 I loved coming a cross an old small Volkswagen Beetle beside the old depots. Speicherstadt. When I arrived in this place I experienced some kind of déjà-vu, as I knew it thanks to old photographs, even if I didn’t know that it was in Hamburg. The ship could be unloaded directly into the warehouses. Today the whole area is being renovated. A dream for the future. 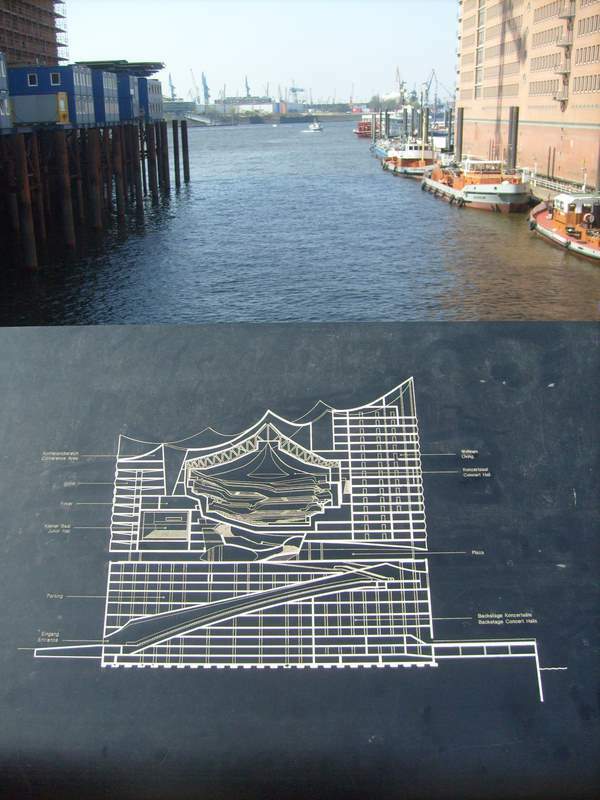 This infographic shows the project for the new building of the Philarmonic, on the banks of the Elbe. The base of the future building is on the left of the image. It will be very recognizable, beside the river. I’d love coming some time and listen to a Wagner opera. We took a boat tour around the port on that same day. 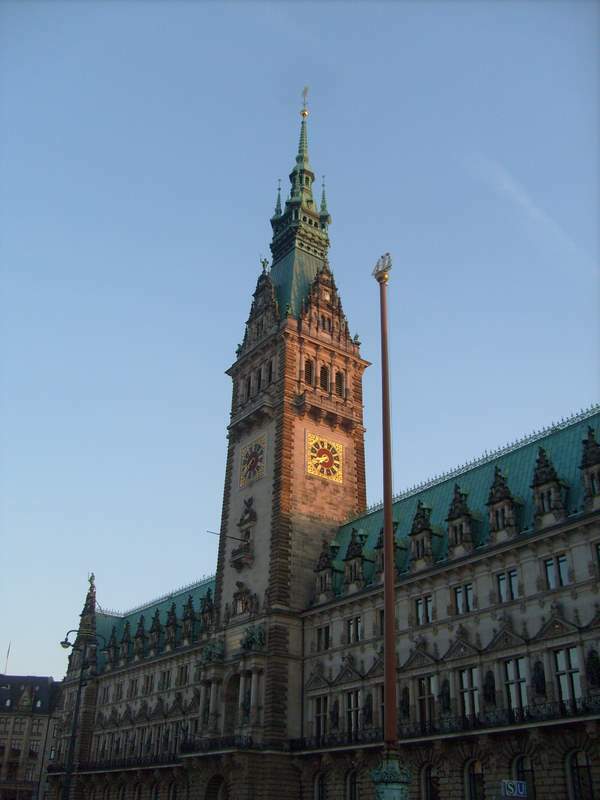 It is a very pleasant experience which I recommend to everyone visiting Hamburg, but there are some many views that the tour deserves its one post. I hope you enjoyed this photos to the point that they are some encouragement to visit this city. The red fox (Vulpes vulpes) is an animal to be found all around Europe, Ireland included. It is not so usual that they show up in urban areas in daytime. A couple of weeks ago we were in a café, looking through the window. 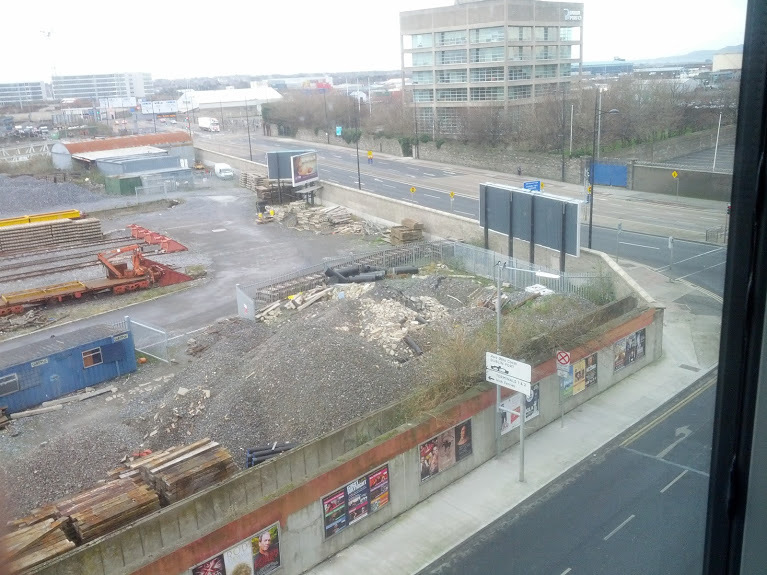 This place is at The Point, an area of Dublin relatively close to the city centre (5 minutes by car or 25 on foot to O’Connell Bridge in the main street). Suddenly three foxes enter a depot. At first time they could have been taken by dogs, but they had that gait so peculiar in foxses. My photographs are not so good, as the distance was a considerable one and there was a dusted pane of glass in the middle. Then I investigated and read a little about this animal. Apparently they don’t go out to see the sunlight or populated areas but in their reproductive period, from December to February, the dog follows the vixen wherever she goes without caring about safety or survival. 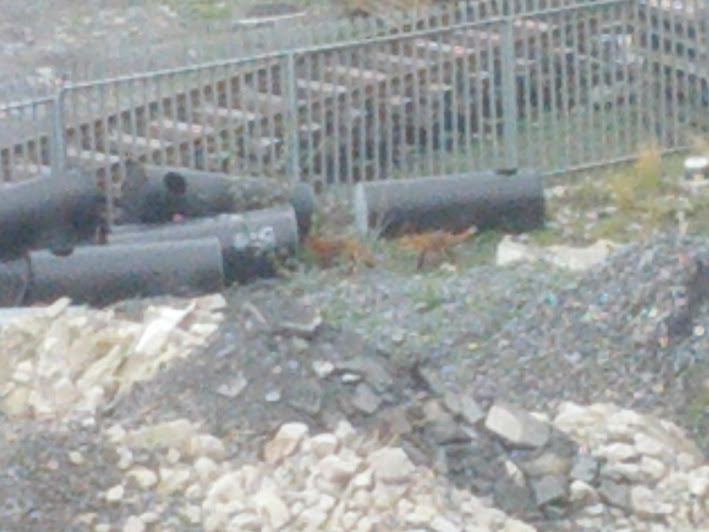 In fact, the couple of foxes that appears in the photograph was sniffing around the railway facilities and from time to time they stopped to mate. The third fox arrived some fifteen minutes later and enter the warehouse that can be seen beside the van on the first photograph. The couple ended up crossing the tracks en mounting the coal load in the background. 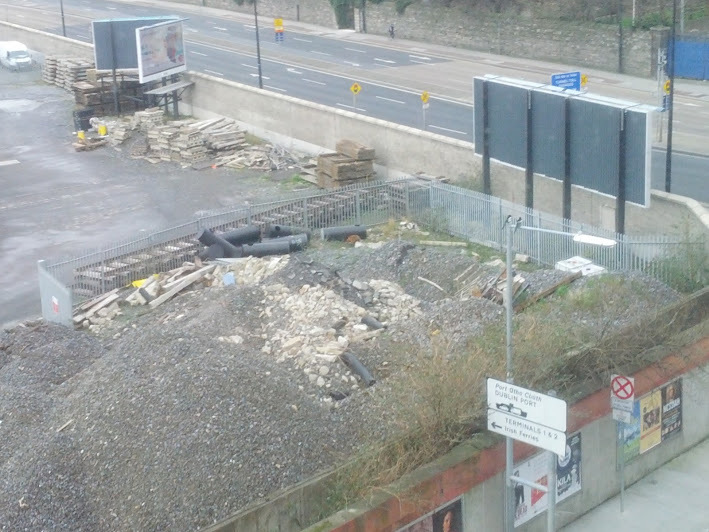 I think the rail tracks, combined with the Royal Canal, may be the corridor by which these animals access the city. In any case this was a little uncommon experience and an opportunity to learn something about Irish wildlife. * A blog about foxes in Ireland, in which they say they even get into houses in the noblest neighbourhoods of this capital. I threw a fiver at this book on my last extravagant spree. I wouldn’t have paid it by its nominal price but then again, what are discount bookshops for? I was intrigued and looking forward to finding out whether it actually contained some user-friendly software with which you’d be drawing nice lines on top-quality or at least funny maps. Not at all. Actually, the CD includes several country layered maps in psd format for which you will need Adobe Photoshop or similar. The book is made out of a series of screenshots which actually may come in handy, as I’ve always hated to jump from on tab to the next, back and forward, which ends up happening whenever you are checking an online tutorial. Good for a fiver, but nothing special. En mi último arrebato consumista he tirado cinco leuros en la compra de este bonito libro con cedél. No hubiera pagado los veinte papeles que se supone que cuesta ni harto de grifa, pero para eso tenemos librerías de descatalogados. Creía que en el cedé vendría algún programa fácil de usar con el que trazar rayitas en mapas curiosos pero nainas. Vienen unos cuantos mapas en formato psd con sus capas y tal, pero para los que hace falta Adobe Photoshop a algún programa parecido. El libro está hecho a base de pantallazos que en un momento dado pueden venir bien, por el rollazo que es andar saltando como poseido de una pestaña a otra, que es lo que uno acaba haciendo cuando uno consulta un manual en el propio ordenador. Que por cinco euros no está mal, pero tampoco es nada del otro jueves. In order to spend a weekend and visit some friends I travelled with some other friends to Milan five years ago. I believed the trip pictures were in the hard drive of that old laptop from which I still need to rescue stuff, but luckily I had save them in one of the DVDs that I seldome made in my rare attacks of lucidity. I’ve spent a nice time watching them and I may publish some at any moment. 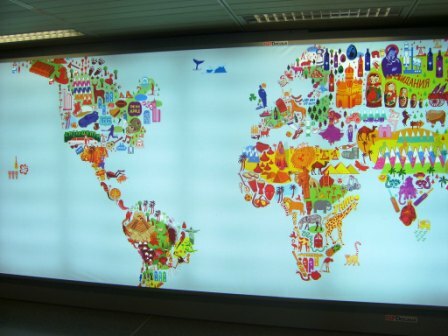 The first thing I’ll drop is an advertising billboard (or may be not, as I never quite knew what it was advertising) that we came across at Linate airport. 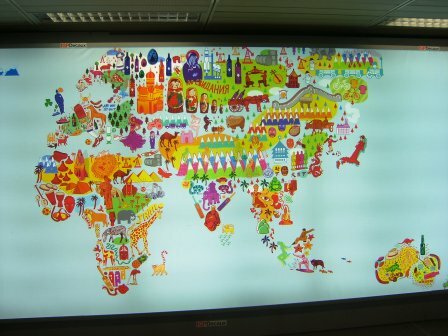 It was a very beautiful world map and I couldn’t resist the temptation to take it with me, in my camera. In Europe we have a nice collection of clichés. Sure I don’t know all of them but, for instance, I can see a bull saying hola! in Spain (and Portugal?). Also a guitar and some wine; a shoe probably for the zapateado and a cathedral that looks like Barcelona’s Holy Family, but placed rather in Santiago. Italy, ciao bella, is inescapably a boot. We also have the English bobby and the Irish shamrock, a Balkanic ballerina, a cook which is maybe from Croatia and a Turkish or Greek waiter. Most of my dear Estern Europe is woodlands in Germany there are sausages, beer and a horse! 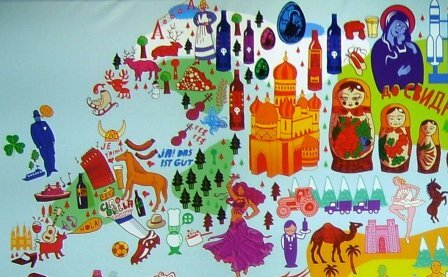 Scandinavia is a place of wood, skates, deer, sleighs, viking helmets and liquors and in the Russian motherland we can see the Kremlin, matrioshkas, icons and space shuttles from Baikonur. And the decorated eggs called pisanky. Last but not least, the Caucasus is a place of tractors and mountains. I don’t know so much about Asia and I expect to be missing even more, but I can see that Russia says до свидания to say farewell to Europe and then a quite empty Siberia is filled with pictures from which the Russians extract petrol barrels and gas. Then the Chinese Great Wall, an important defence element whose main mission is to have hundreds of restaurants named after itself. China is reduced to a water buffalo and the spiky Himalayan mountains; a rice bowl and a the multi-colour terracotta army. The Indian subcontinent is represented with images of The Book of the Jungle: elephants and snakes, frankincense and a holy man. In Indochina, a big-bellied Buddha and a Balinese dancer, mountains that could be Krabi islands. Korea is a dragon and Japan is a geisha ¿is it possible that a football player, a memento of that World Cup, sits between them? 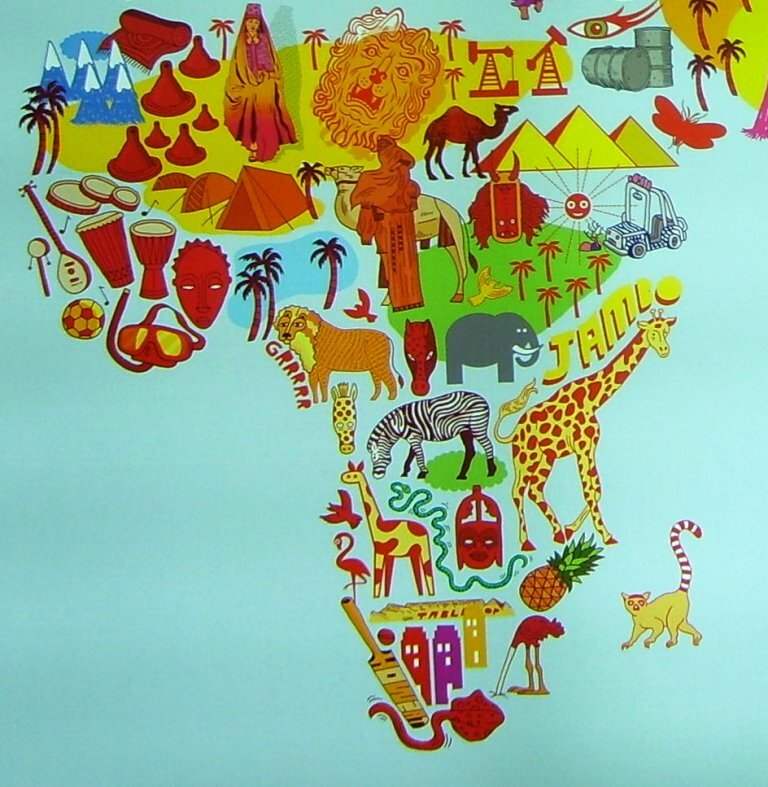 Africa is the craddle of mankind. If we start in the Maghreb we find some mountaints that must be the Atlas, palm trees, camels, heaps of sand and the pyramids of Egypt. A little farther away in Palestine is where God lives and that’s why his eye is showing up. In the Gulf of Guinea, masks and djembes and also a football, probably because the best teems in the continent (Ghana, Ivory Coast) belong to the area. Southwards the wildlife including giraffes, zebras, elephants, lions… and the Madagascan lemur. America is the most mixed continent. Canada shows up a a huge nature reserve. The United States are the largest arrival country and the iconic one par excellence. The skyscrapers in its Big Apple, its Route 66, baseball, Californian paradise. 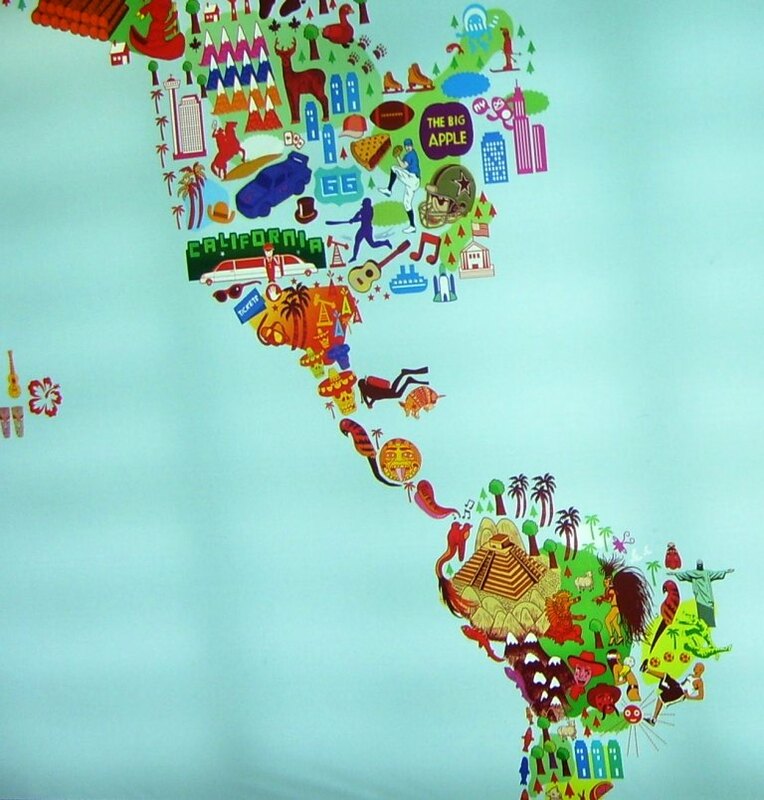 Mexico looks just like holidays and sombreros and farther South we’ve got pre-Columbian pyramids, many palm-trees, some Amazonian Indian, the Corcovado Christ, o futebol, and the imposing Andes. 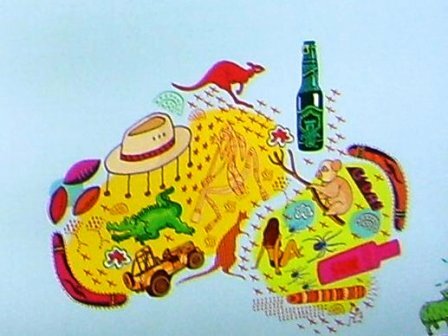 In Oceanía everything is commonplace: kangaroos, boomerangs, crocodiles, koalas, dreamlines, rugby and the typical hat. I can see a bit of green Kiwi sheep. I never understood whether the continent is Australia or Oceania. I will have to study better both continents and what they contain. If anybody detects an object that I may have omitted (I simply couldn’t write about them all) with an interesting name or story, I thank you in advance for the comment.